From April 20-26, 2009, children and adults around the world are invited to participate in Global Action Week. 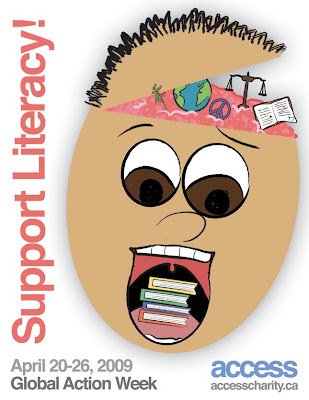 This year’s theme is Literacy, featuring the Big Read event. ACCESS is promoting Global Action Week and is encouraging schools, students, and individuals to take action! A webpage has been launched at www.accesscharity.ca/globalactionweek. Global Action Week is lead by the Canadian Global Campaign for Education, a coalition of NGOs, research institutes, faculties of education and teachers’ federations that are helping more people receive a quality education throughout the world. The Big Read campaign’s aims to increase awareness of the struggles of those who are deprived of the chance that an education gives them in life. Unable to read, write or count, many cannot defend their rights and are often trapped in a lifetime of poverty. Around the world there are about 774 million illiterate adults, the majority being women. Occurring in over 100 countries, the week is part of a campaign to give every child and adult in the world an education by 2015. Consider participating in support of the campaign for Education for All and ACCESS international education projects. Together, help to become the first generation to ensure that the entire world can have a quality education! For full details and resources on how to take action during Global Action Week, please visit www.accesscharity.ca/globalactionweek! To subscribe to further Email Updates from ACCESS, please click here. For more information and resources, please visit www.accesscharity.ca.